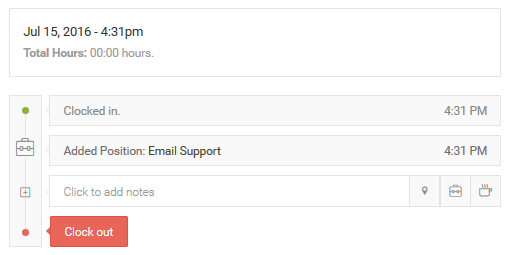 To clock in log into your account and click on the tab 'Time Clock'. On the 'Overview' page you will see today's date and the button to 'Clock In'. Once you click on this button, the active clock will start. Once you click 'Clock in' you will see the time clock 'Timeline' where you will see a timeline of your shift from clock-in to clock-out. At the top you will see today's date and time and below that you can see your 'Total Hours' thus far clocked in. The start of the 'Timeline' will show the time clocked-in and below the option to add notes and the 'Arrow' icon where you can select or change mid-shift your 'Position'. At the bottom, you will see the 'Coffee Icon' 'Break Button' where you can stop the clock for a break in your shift and the timeline will keep track with a visual display. Now it shows when the break started with a white notch, the corresponding time and your note. Once you return click 'Continue Shift'. 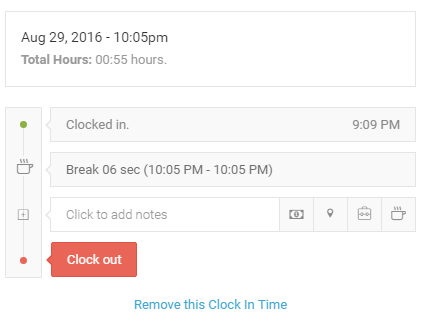 Now it will show your break on the timeline along with the total break time withclock in and out times. Once finished click the 'Clock out Button'. 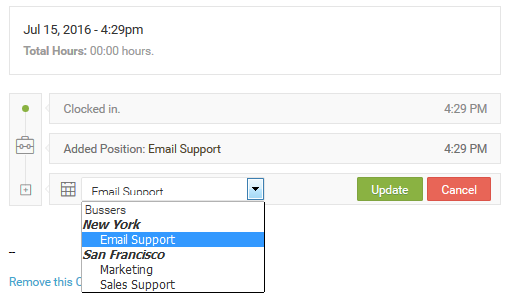 Managers can enable the GPS option from the Time Clock Settings. With GPS setting enabled, staff members' clock in / out will be captured and will be shown next to clock In / Out times as map. To provide an easy to setup & affordable biometric time-clocking solution, a webcam can be required for time-clocking. Managers can enable that from the time Clock Settings. To use the webcam functionality, staff will both need an installed webcam and the Adobe Flash player installed on their web browser. The first time, the app will require webcam access. Right click on the message box or click the radio button to allow the app access the webcam. Managers can restrict the staff clock In / Out to specific locations i.e. a computer or multiple computers connected to a specific Static IP with your ISP provider. 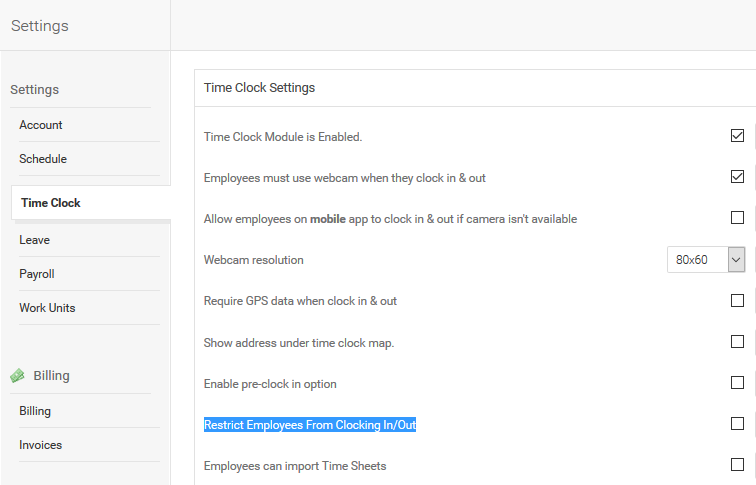 Now go to the Time Clock Settings first and enable the option 'Restrict Employees From Clocking In/Out'. 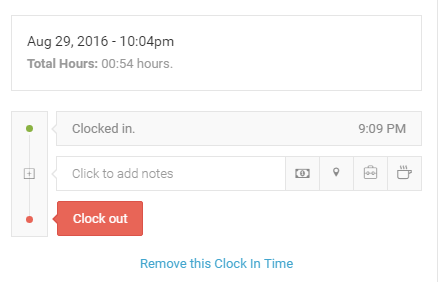 As opposed to simply Clocking In and Out, managers can manually add time sheets. 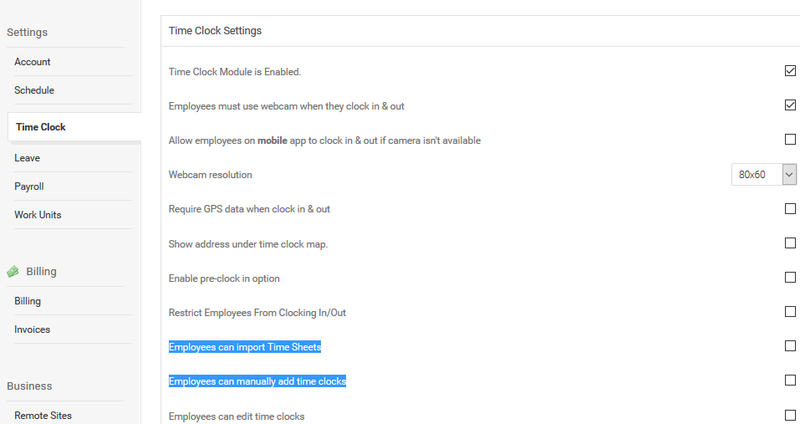 Managers can also enable this option for their staff to add Clock Times Manually. There is also the ability to select the 'Only Clock In' which allows staff to historically clock in if they forgot to clock in at an earlier time. Please feel free to let us know of any feedback by emailing support@humanity.com.